I have purchased two tentacle devices. I need the software to sync my material. I see nowhere to register my devices or get a License Key. I plugged in one of the tentacles and was able to sync the test that I did but could not export the media because I have no License Key. Please help. Where do I register? How do I get a License Email and License Key? You could use the Tentacle device as ‘dongle’. You say you tried, but did you turn it on? Your Tentacle is the key! 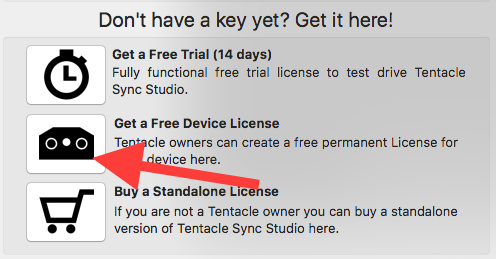 You just have to download the latest version of Tentacle Sync Studio, open the license panel, connect a Tentacle unit to your computer and hit the “Get free device license button”. After that you will get a key for each Tentacle wich can be used independently from the hardware unit.